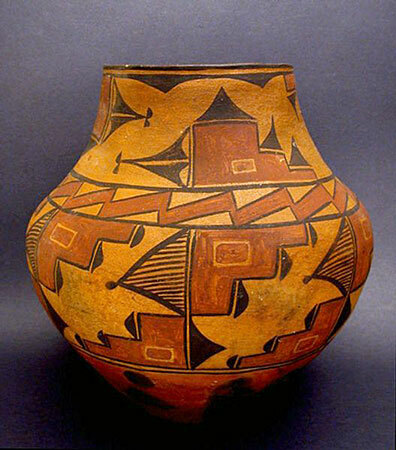 This exceptional and uniquely designed Zia Pueblo polychrome jar, of classic form, with an elongated tapering neck, painted in red, black, and orange, over a dark creamy-tan slip, has a narrow and deeply concave base. The design includes: conjoined feather devices combined with triple-stepped devices capped with triangles on the neck, below a black, partially scalloped band; another band encircling the shoulder with multiple rectangular devices; six repeating bordered rectangles encircling the body with stepped half-tableta-like devices, hatched and solid triangles within corresponding corners; a double black band encircling the body above the base; and a signature on the solid orange base: ³Martina Pino² , in addition to other inventory numbers and ³7.00² in red. Condition: Aside from a few minor abrasions, this jar is in excellent condition. The interior was "waterproofed" with an old sealant for native usage in the distant past. Provenance: This superb vessel was created at Acoma Pueblo by Martina Pino (b. 1880), matriarch of the distinguished Pino Family, leading artists of the Zia Pueblo pottery tradition, during the first third of the 20th Century. A Southern California collector acquired this jar from the Bishop Gallery in Los Angeles during the 1960s.